Kaila is currently pursuing a Masters of Environmental Studies at York University, with a focus on the socioeconomic factors that affect a population’s health and relationship to the environment. Claire: What inspired you to become involved with urban forests? Kaila: When we think about trees, we think about hiking trails, cottages, or conservation areas far far away. We don’t often give much thought to the trees in cities, but the truth is the urban forest has a major impact on our daily lives. What really made me realize this was when I was travelling between different cities throughout university, and I noticed how the Emerald Ash Borer was killing off thousands of urban trees in both my hometown and university town! It became important to me to help find ways to mediate the immense damage. The effects of losing our urban trees can cause serious disruption in our lives! 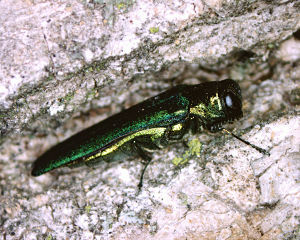 Kaila witnessed the destruction that the Emerald Ash Borer caused throughout different urban forests, and realized that she had to take action. Claire: How did you find out about LEAF? How have you been involved? 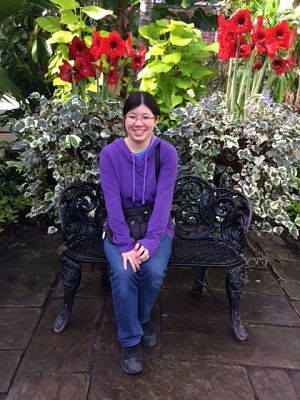 Kaila: In the past, I worked to help strengthen Ottawa’s Urban Forest Management Strategy. When I moved to Toronto, I still wanted to be heavily involved with this type of work. I was immediately drawn by LEAF’s mission to help improve and preserve the urban forest. I’m pleased to now be directly helping Ontario residents get more trees into their yards with LEAF! 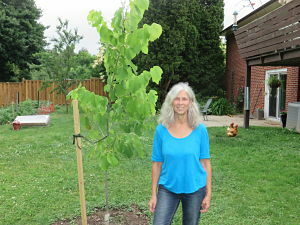 As part of the Backyard Tree Planting Program, Kaila is helping Ontario residents like Nadia plant trees in their backyards, which help to enhance and diversify our urban forest. Claire: Why is the urban forest important to you? What message would you share with others to encourage them to become involved? Kaila: It’s pretty easy to take the urban forest for granted. We just assume nature will find its own way and don’t appreciate how much harder it is for trees to survive and thrive in an urban setting. From dealing with pollution, vandalism, compaction and other stresses, urban trees are definitely their own category of superhero! It takes a lot of time and effort from both natural processes and human initiatives to grow a strong, healthy urban forest, so please be kind to urban trees and take care of them!